It's not uncommon to hear that golf is an expensive game. This is true at times, however there are many ways to lower your scores and improve your game and equipment for little or no money. Here are three of the best ways to lower your scores for under €5. Best of all they require no practice!!! A brush or nailbrush is a great piece of equipment. Golf grips can get shiny and slippy from dust, sunscreen etc. As a grip is the only piece of golf equipment that you have contact with it's important to keep them clean, so you maintain a good hold on the club. A good scrub with a brush and hot soapy water is a great way to get the grime out of grips and making them feel fresh again. If they still feel a little slippy after a wash a little rub with some sandpaper before washing can refresh them a little bit more. 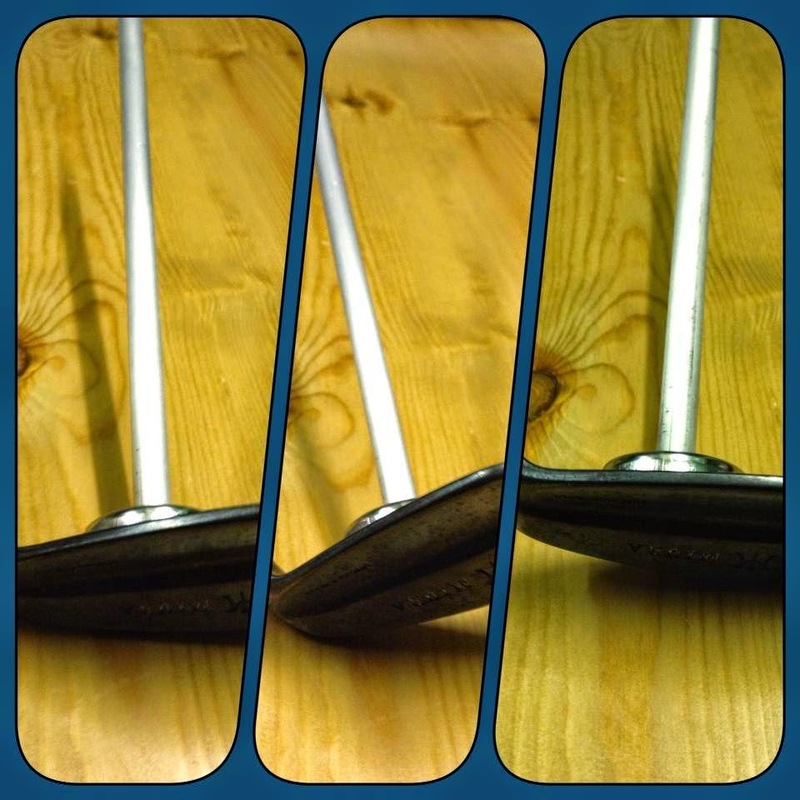 Second use for a brush is to clean the grooves of the clubface. The grooves on the clubface are there to give dirt, grass and water somewhere to go when the golf ball and clubface impact. If grass, water or dirt get between the ball and clubface they can reduce friction between the ball and clubface reducing spin and causing a 'flyer' where the ball travels much further then expected. A nice clean clubface like the one above will create the correct friction between the club and ball giving consistent spin rates and golf shots that are easier to judge. A little note on friction, if there is a material like sand on the face of a wedge maybe you should not wipe it off if you're looking for a bit more spin on a shot. Sand increases friction between ball and clubface giving more spin. After a bunker shot it might be an idea to leave the sand on the face of the wedge, as the next shot you play with the club might require a little more stop. How can foot spray help your golf? It's great for finding the impact point on the clubface!! Other things like impact tape can alter the flight of the ball whereas foot spray has little effect on the flight. Just spray some powder on the face, hit a few balls and see where the impact is. Impact point on the face has a big bearing on the flight of the ball due to gear effect. A simple explanation of gear effect is when the ball is hit off center the clubhead twists and imparts spin on the ball. When it is hit off the heel it starts further left and moves left to right, off the toe it starts further right and moves right to left, high on the club it launches higher and spins less and off the bottom it launches lower and spins more. There is also a loss of ball speed and distance with off center hits. If you notice a pattern in your mishits for example in the above picture the top photo has a pattern of heel hits then simply moving the ball/clubface alignment can lead to more centered strikes. For the above case lining the ball more towards the toe at address can lead to centered strikes. Length of the club can also be a factor, longer clubs can lead to heel strike patterns and shorter clubs can lead to toe strike patterns. Lengths of clubs can be adjusted easily. So, knowing your impact point on the face coupled with a simple adjustment or two can lead to longer and straighter shots. A Sharpie Pen is a great way to find if the lie angle of the club is correct for you. Use to sharpie pen to draw a straight line on one half of the ball. Place the ball on tee with the line vertically positioned so the line will contact the club face at impact. It's not necessary but you can put some face tape on an iron. The face tape just makes it a bit easier to see the impact but normally you can see the impact on the club face. Then hit a shot with the iron. There are three possible results. If the line is straight like the first photo then the dynamic lie angle is correct. Ball should fly according to what the swing does. If the top of the line goes from toe to heel, second photo, the dynamic lie angle is too upright and the ball should fly more right to left then the swing would suggest. If the top of the line goes from heel to toe, third photo, the dynamic lie angle is too flat and the ball will fly left to right more then the swing suggests. The above photo illustrates how lie angle affects where the face is pointing. Correct lie angle, face points straight, too upright to the left and too flat to the right. If the lie angle of the clubs is out they can be changed easily with a loft and lie machine. We have one here at Drive Golf Performance in Riverstown and a set can be altered for €30. 3 easy ways for under €5 to improve your golf are, brush to clean grips and grooves, foot spray to identify impact point on the face and sharpie pen to identify correct lie angle in your irons. Golf improvement doesn't necessarily require big investment or a change in swing. Try these out to see if they help your game. Comments or questions are always welcome.